( these pups are no longer available, but still fun to see ). fully vet vaccinated ( 3 sets ) and micro-chipped. "Zip" is a cool little guy. Dark red tri with one blue eye and the other half blue. He loves to snuggle and is not hyper, but he is active and would like a job to do. I'm holding onto him until the right home comes along. Will offer discount to a performance home before his formal training begins in March. See the " AVAILABLE " page for more info and photos. best suited for most Aussies (& MAS). Puppies going to non-show or non-performance homes must be spayed or neutered at the age appropriate time and our contract states that the dog is not to be bred. Puppy prices depend upon many factors : size, parents, titles, co-own, contract, etc. I do give discounts to proven performance homes, buyers coming from out of state, buyers who have (had) another dog from me - and private treaty agreements. so those pups can help cover part of the cost of having the litter (if any are for sale). them, although I would have liked to. Since breeding is a lot of work (when done right) and I don't have a lot of time to devote to breeding, a co-own (partner) home is always welcome and considered for my pick of the litter pup. However, I do not want my pick pup in a breeder home that does not intend to keep their dog for life. My hope is to find that forever home where the dog will be part of the family and get to participate in activities and would allow me to get a puppy back from that dog (in the future and only after the dog is deemed worthy of reproducing). a money-back health and temperament guarantee. These are herding breeds that enjoy activity and owners who invest time and training into their canine companions are tops in my book. 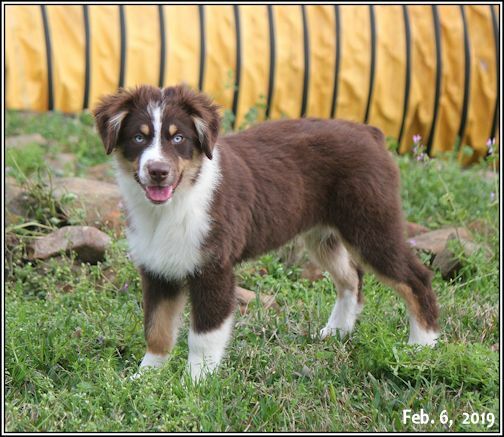 Some Aussies and Mini American Shepherds are less active and do well in less active homes, but owners willing to go the extra mile for their dogs get the first choice in pups (after evaluations). Our puppies are NOT SOLD on a first come basis, as we always get the first pick puppy from each litter and we generally have people waiting on a specific type of puppy ( gender, size, color, agility, etc. ). I've found that many "pet" homes want a puppy "right now" and they are just shopping around for availability or color, so there is no need for me to gather "forms" unnecessarily or lock someone in with a deposit. Since breeding is not a business for me, I never know when I will plan another litter, so I'm not willing to hold a deposit until a next litter. Normally the performance homes will wait on the right pup and some folks have waited a couple of years for that special team mate, so I am grateful for those types of homes. 1) Yes, this breed does shed - lightly year round & heavy seasonally. 2) Yes, requires daily exercise - and some dogs more than others. 3) Can become protective of their family or property. leave our home. Face-to-face and phone "interviews" can help me decide if the prospective owner is dedicated to providing 12-15 years ( on average ) with their new family member. First of all, so that YOU (the buyer) knows first hand what you are getting and you are happy with the puppy. Secondly, according to USDA law : If breeders allow BUYERS to physically observe the animals before or during PURCHASE and on the premises where they were born & raised, the breeder is NOT subject to USDA licensing. Since Sept. 2013, the new APHIS "Retail Pet Rule"
and who have an internet select and pay system set up.